Skateboard legend Jamie Thomas and the team representing his footwear come clothing brand Fallen are set to hit the UK this weekend with a string of demos in the Cornwall area. Thomas brings with him a crew that includes Tom Asta, Tommy Sandoval, and Garrett Hill amongst others, who will all be tearing up three Cornwall spots this Saturday, kicking off their European tour. 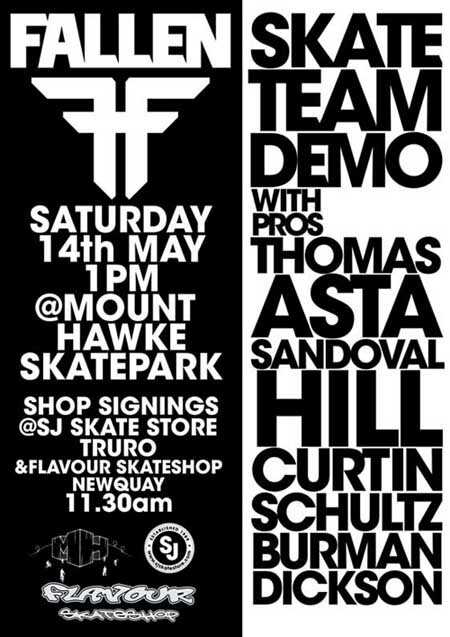 The day will start with a two part meet and greet/signing session, at both Truro’s SJ’s Skateshop, and Newquay’s Flavour Skateshop. Following that, the team will be hitting Mount Hawke Skatepark for s few hours, before finishing the day with an after party at the Chy Bar. We hear there’s also a second demo on Sunday, at an undisclosed location, to be announced at some point tomorrow. All the info you should need can be found on the flyer below. Check the video for an idea of what to expect from the main man, and find out more at Fallen Footwear.